What it is: Personal injury protection, known as PIP, pays for car-accident injuries regardless of who’s at fault. Who is covered by PIP: PIP generally covers the policyholder and family members in the household, passengers in the vehicle, and others who are driving the car with permission. Your PIP can also cover you if you’re injured while riding in someone else’s car, or if you’re injured by a vehicle as a pedestrian or cyclist. How PIP relates to no-fault insurance: PIP is required in 12 no-fault insurance states. In these states, you make a claim for accident injuries on your own PIP insurance unless the injuries are severe enough to meet a certain threshold, which is determined by each state. Once you meet the threshold you can sue someone for injuries, pain and suffering. But PIP is also available in some states that don’t use a no-fault insurance system. What’s a threshold? In no-fault insurance states, the threshold determines whether you’ll make a PIP claim or if you can sue. If someone can sue you, you have “tort liability.” Thresholds either describe the severity of the injury or are a dollar amount, depending on the state. In any action for tort brought against the owner, operator or occupant of a motor vehicle or against any person legally responsible for the acts or omissions of such owner, operator or occupant, a plaintiff may recover damages in tort for pain, suffering, mental anguish, inconvenience and other nonpecuniary loss because of injury only in the event the injury requires medical treatment of a kind described in this act as medical benefits, having a reasonable value of $2,000 or more, or the injury consists in whole or in part of permanent disfigurement, a fracture to a weightbearing bone, a compound, comminuted, displaced or compressed fracture, loss of a body member, permanent injury within reasonable medical probability, permanent loss of a bodily function or death. Any person who is entitled to receive free medical and surgical benefits shall be deemed in compliance with the requirements of this section upon a showing that the medical treatment received has an equivalent value of at least $2,000. Any person receiving ordinary and necessary services, normally performed by a nurse, from a relative or a member of such person’s household shall be entitled to include the reasonable value of such services in meeting the requirements of this section. A plaintiff may recover damages in tort for pain, suffering, mental anguish and inconvenience because of bodily injury, sickness or disease arising out of the ownership, maintenance, operation or use of such motor vehicle only in the event that the benefits which are payable for such injury as “medical expense” or which would be payable but for any exclusion or deductible authorized by this subtitle exceed $1,000, or the injury or disease consists in whole or in part of permanent disfigurement, a fracture to a bone, a compound, comminuted, displaced or compressed fracture, loss of a body member, permanent injury within reasonable medical probability, permanent loss of bodily function or death. In any action of tort brought as a result of bodily injury, sickness or disease arising out of the ownership, operation, maintenance or use of a motor vehicle within this commonwealth by the defendant, a plaintiff may recover damages for pain and suffering, including mental suffering associated with such injury, sickness or disease, only if the reasonable and necessary expenses incurred in treating such injury, sickness or disease for necessary medical, surgical, X-ray and dental services, including prosthetic devices, and necessary ambulance, hospital, professional nursing and funeral expenses are determined to be in excess of $2,000 unless such injury, sickness or disease (1) causes death, or (2) consists in whole or in part of loss of a body member, or (3) consists in whole or in part of permanent and serious disfigurement, or (4) results in such loss of sight or hearing … or (5) consists of a fracture. A person remains subject to tort liability for noneconomic loss caused by his or her ownership, maintenance or use of a motor vehicle only if the injured person has suffered death, serious impairment of body function or permanent serious disfigurement. (2) a total of $20,000 for income loss, replacement services loss, funeral expense loss, survivor’s economic loss and survivor’s replacement services loss arising out of the injury to any one person. The threshold for a lawsuit is bodily injury that results in death, dismemberment, significant disfigurement or significant scarring; displaced fractures; loss of a fetus; or a permanent injury within a reasonable degree of medical probability, other than scarring or disfigurement. An injury shall be considered permanent when the body part or organ, or both, has not healed to function normally and will not heal to function normally with further medical treatment. New York’s “serious injury” threshold is a personal injury that results in death; dismemberment; significant disfigurement; a fracture; loss of a fetus; permanent loss of use of a body organ, member, function or system; permanent consequential limitation of use of a body organ or member; significant limitation of use of a body function or system; or a medically determined injury or impairment of a non-permanent nature which prevents the injured person from performing substantially all of the material acts which constitute such person’s usual and customary daily activities for not less than 90 days during the 180 days immediately following the occurrence of the injury or impairment. In North Dakota the “serious injury” threshold is an accidental bodily injury that results in death, dismemberment, serious and permanent disfigurement or disability beyond 60 days, or medical expenses in excess of $2,500. “Limited Tort” Option: The laws of the Commonwealth of Pennsylvania give you the right to choose a form of insurance that limits your right and the right of members of your household to seek financial compensation for injuries caused by other drivers. Under this form of insurance, you and other household members covered under this policy may seek recovery for all medical and other out-of-pocket expenses, but not for pain and suffering or other non-monetary damages unless the injuries suffered fall within the definition of “serious injury” as set forth in the policy or unless one of several other exceptions noted in the policy applies. “Serious injury”: a personal injury resulting in death, serious impairment of body function or permanent serious disfigurement. Note: There are several exceptions to the Pennsylvania threshold that would allow someone to pursue a lawsuit even if they have a “limited tort” insurance policy. These include being injured as a pedestrian or cyclist, if the other driver is convicted of a DUI for the accident, or if the other driver is from out of state. Limitations, exclusions and conditions to personal injury protection. What PIP doesn’t pay for: It doesn’t pay for car repairs, in most states with PIP. If you want insurance compensation for damage to your vehicle, you can make a claim against the at-fault driver’s auto insurance or on your own collision insurance, if you have it. Kentucky, Pennsylvania and New Jersey You can pay more for the unlimited right to sue over injuries. Washington, D.C. If you choose no-fault coverage and are involved in an accident, you have 60 days to decide whether to stick with no-fault insurance or make a claim against the other driver. Michigan Michigan’s no-fault insurance system is unusual in providing unlimited lifetime reimbursement for medical bills and rehabilitation. Michigan policies also provide reimbursement for lost wages for three years and “replacement services” like child care. Michigan policies include property protection, which pays up to $1 million for damage your car does to others’ property in Michigan, such as fences and parked cars. What’s the point? No-fault insurance was designed to reduce lawsuits by restricting people’s ability to sue over car-accident injuries. One advantage of this is that PIP claims are generally paid out promptly. PIP costs: Depending on your state, the cost of buying optional PIP coverage might be relatively low. 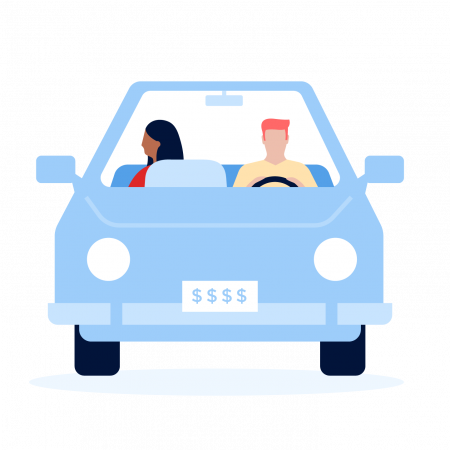 NerdWallet research shows that PIP added about $50 to the annual cost of car insurance in Maryland and about $150 in Texas. Methodology: Average annual premiums are an average of car insurance quotes for single 30-year-old male and female drivers for six ZIP codes in each state. Rates include policy liability limits of $100,000 for injury for one person, $300,000 for all injuries and $50,000 for property damage in an accident, plus collision and comprehensive coverage. They also include $15,000 in PIP in New Jersey and Pennsylvania, and $10,000 in PIP in Kentucky. Is PIP the same as MedPay? No, although medical payments coverage is similar to PIP and is not available in all states. MedPay covers medical bills and funeral costs. In some states, like Massachusetts, you can buy both and use MedPay to cover your PIP deductible. The health insurance route: You could forgo PIP where it’s optional and use your health insurance for car accident injuries. But if your health insurance has high deductibles and co-insurance, which is a percentage you pay for bills after the deductible, consider that PIP sometimes has a low deductible or no deductible. PIP may, however, have co-insurance, much like health insurance. PIP has other benefits, too, including coverage for any passengers in your car and replacement of lost wages, which health insurance doesn’t provide. NerdWallet’s car insurance comparison tool can help you price out the options.